Camping is always a welcome breather from the madness of modern urban living. When camping, most people are looking to switch off from the mundane busy life. It is therefore not uncommon to see minimal use of the technology and gadgetry that plagues our day to day lifestyle. This minimalistic living does not, however, take away the bare necessity – electricity. The best RV solar panels come in handy to ensure that you have the necessary power to provide lighting as well as power up the few devices that you may have with you while on the move. Above all, independence from the grid while boondocking! Solar panel technology has improved by leaps and bounds over the years making a simple RV solar panel purchase quite the challenge. 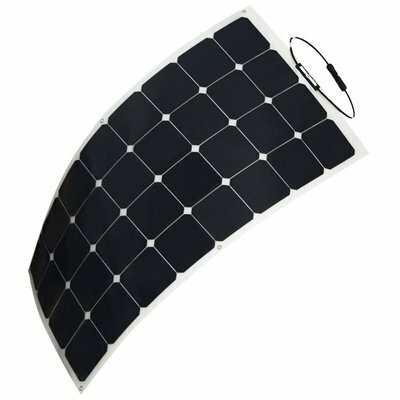 The aim of this simple guide is to provide you with everything you need to know to buy the best RV solar panels to suit your unique power needs. Let’s first take a look at some of the market’s best sellers. 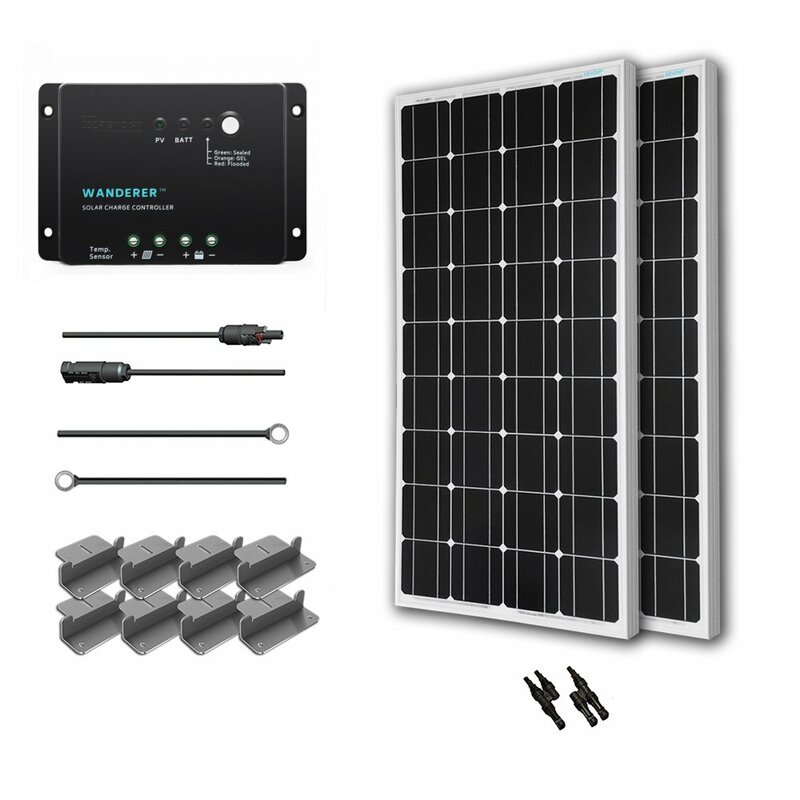 When you want free power on the go for your RV, then Renogy solar starter kit is reliable. The Renogy solar kit’s efficiency in providing power is subject to the weather condition just like any other solar panel for that matter. On a perfectly sunny day, you can expect to receive the maximum power output of 100 Watts. This power output is bound to decrease with cloudy or near cloudy weather conditions. The monocrystalline battery is suitable for charging a 12-volt battery. To help keep the power generated from being discharged in the absence of sunlight, the panel’s junction box comes pre-installed with diodes. While it comes with the connector pre-attached to the panel, it lacks all other necessary mounting hardware. You will, therefore, be forced to source these products separately. It also comes with standard MC4 connectors. This solar panel is suitable for use not only on the roof of your RV but on any other motor home. It can either be mounted on the ground or use an off-grid rooftop mounting. It is built for durability with the ability to tolerate winds of 2400Pa and 5400Pa in the snow. Its aluminum frames not only add durability but also make them lightweight and easy to handle. The solar panels come with a 25-year warranty for their transferable power output capabilities and a five-year warranty on the parts used to manufacture the panels. These solar panels weigh between 7.5 and 9 kgs and measure 47 inches in length, 21.3 inches in width and 1.4 inches in height. The WindyNation 100W is designed to be a versatile solar panel to harness sun’s clean and free energy. Not only it is ideal to meet the power demands of an RV, but it can also used on boats or even at home. The boat kit comes with one solar panel, 40-foot UL listed 12 AWG cable, a 30-amp charge controller that has a P30L LCD display and a temperature sensor. It also includes mounting hardware, MC4 connectors as well as manual to guide users on the installation procedure. It is capable of providing an average power output of 33Ah on any given day depending on the sun’s availability. Users can easily adjust the settings of the charge controller and can use its LCD display to monitor the battery temperature, the amp-hours, voltage or amperage, and the direct current load draw. 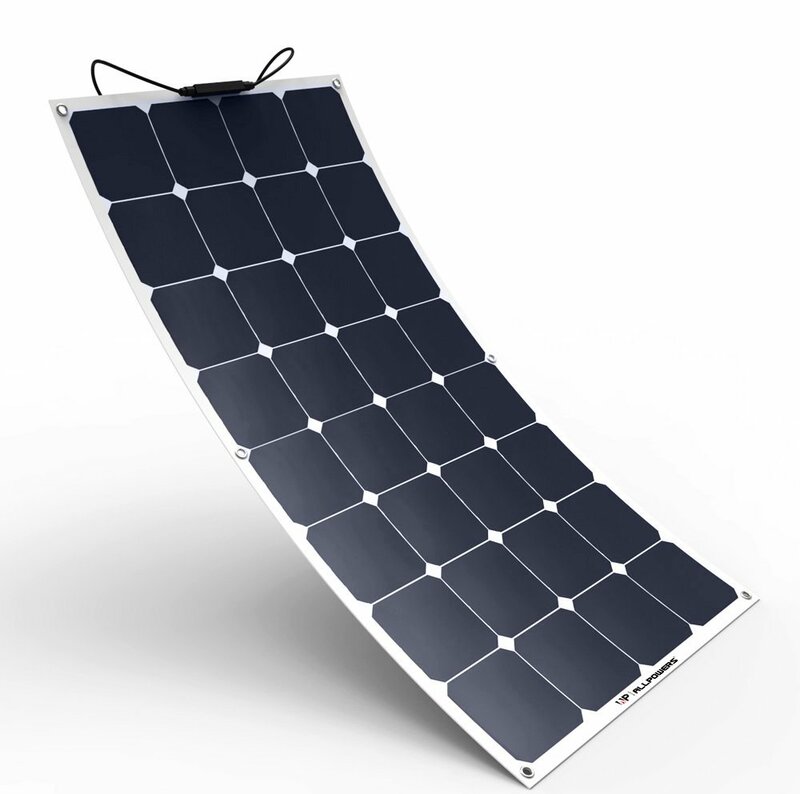 The solar panel is compatible with a 12V battery system. The charge controller is capable of handling four to eight 100W panels for the 12V and 24V systems respectively. It also doubles as a protective mechanism for the battery in the event that there is a power surge, short-circuiting, an overcharge or discharge, reverse polarity or a battery overload. The panels have UL 1703 certification and are renowned for their durability, practical usability as well as their reliability. The manufacturers of this panel make use of stainless steel and anodized aluminum to make the fastener and mounting brackets respectively. The choice of material enhances the panel’s durability. The panel also comes with a five-year warranty. The HQST 100 Watt 12V monocrystalline Lightweight solar panel is designed to be used on your RV, boat, or for any off-grid use. It makes use of plastic laminated, monocrystalline cells to produce the much-needed power. It is designed in such a way that it can be mounted using screws, zip ties, adhesive tape, Velcro or grommets. To ensure that the mounting process is hassle free, the solar panels come with pre-drilled holes. Its flexible nature not only makes it easy to mount but space friendly as well. It also comes with two, 10-inch cables, MC4 connectors and a waterproof junction box and it is capable of achieving a maximum power output of 100 Watts. This solar panel measures 41.7 inches in length, 21.3 inches in width, and 0.12 inches in height and weighs a total of 5.25 pounds. Perhaps the best quality of the All Powers Bendable solar panel is its bendable nature. This feature allows users to achieve a bit when mounting them as opposed to their stiff counterparts. The 300 bend that is achievable with this solar panel keeps you from damaging or breaking it during installation. Its light weight makes it easy to carry and handle. The panel boasts of 25% energy efficiency, and it is built to be compatible with 12V battery systems. It is also built for durability by making it both heat and water resistant. It has been designed to withstand up to 50psf in air stress and 113psf in snow-related stress. This monocrystalline and photovoltaic solar panel is made from crystals made from single silicon. This choice of material helps to improve its energy efficiency, and you can travel farther off the grid. The Renogy 200W solar panels are distinct from their counterparts due to their iridescent blue or black color. 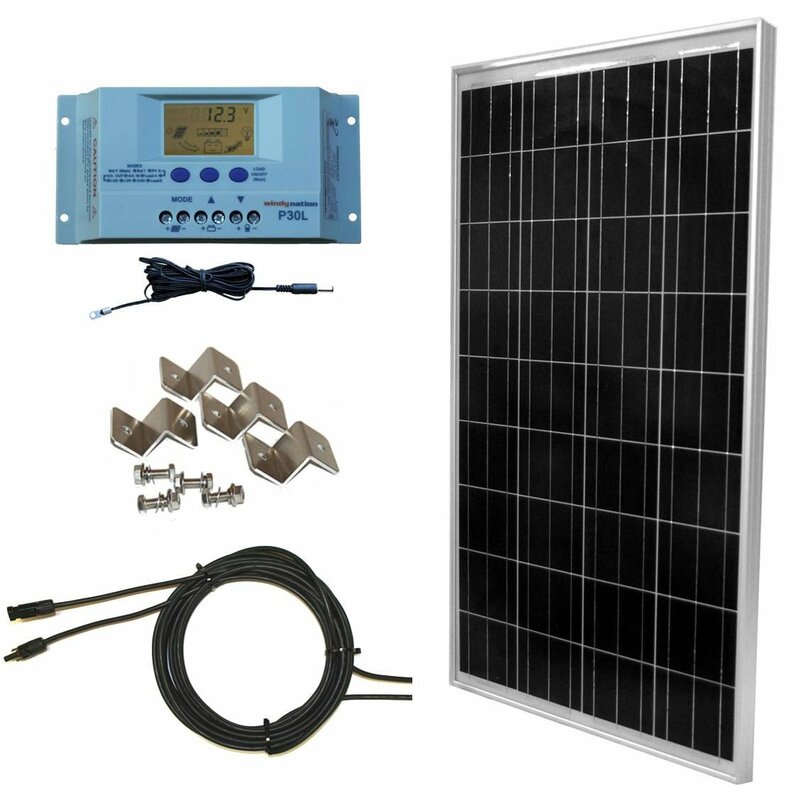 This starter kit comes with two 100W high-efficiency monocrystalline panels, 30A PWM charge controller that makes the system expandable to the 400W system. It has an average output of 1000Wh on any given day. Like any other solar panel, its power output is dependent on the availability of sunlight. Also included is10AWG tray cable that is eight feet in length. This solar panel measures 47 inches in length, 21 inches in width and 3 inches in height and weighs approximately 47 pounds. Its light weight makes it easy to carry and handle. When setting up the solar panel, be sure to position it in such a way that it receives enough sunlight. To avoid damaging your solar panels or placing them in the wrong way, it is advisable that you enlist the help of professional. To improve its efficiency even under cloudy and shady conditions, the panels are fitted with bypass diodes that keep energy from being discharged. It comes with an off-grid mounting option. Aluminum is the material of choice for the frames. To further protect the panels against chemical or environmental corrosion and damage by water (low pressure), the panels have an IP65 junction box. This helps to improve their durability of the panels. Having a solar panel system can come in handy especially when you are on the move. It provides the necessary power to run your appliances. This means that you can still have fresh foods, access your gadgets, and lighting even when in the middle of nowhere. The problem, however, is choosing the best RV solar panels for your needs. To help make it easier for you, here are a few things to keep in mind when shopping for a suitable solar panel. A working knowledge of the different types of solar panels that exist in the market is a good starting point in your journey to selecting a suitable solar panel. All solar panels are similar in that they all use silicon as the primary raw material. What differs is the construction and purity. There are four categories of solar panels available on the market today. First, we have the monocrystalline panels. These panels use the purest available silicon. They are costlier than their polycrystalline counterparts but are also more energy efficient and outperform the latter in shaded or poorly lit conditions. Polycrystalline panels are made from less pure silicon and are not as energy efficient. However, they are the most preferred due to their low cost. Thirdly, we have thin film panels. These make use of small amounts of silicon infused in substrate surfaces. The result is a pocket-friendly solar panel that has a reduced energy efficiency of about 7-8%. Lastly, we have the Copper Indium Gallium Selenide (CIGS in short) solar panels. This is a variant of the thin film panels that is about 2-5% more energy efficient and has reduced cadmium levels. The Ideal solar panel for use on your RV should be one that has high energy efficiency, easy to handle and install and light in weight. It is important to note that a few tradeoffs will be expected to be made as all these characteristics are rarely found in one solar panel package. The primary purpose of a charge controller is to regulate the power that reaches the battery to improve its longevity. Charge controllers come in different forms depending on their functionality. First, we have the single phase controllers. These are single output chargers that often operate at high voltages. They are, therefore, useful in supplying a high amount of power over a short period. Next, we have the single phase trickle controllers. Unlike the single-phase controllers, the trickle controllers operate at lower voltages. While the former is excellent when it comes to reviving a dead battery the latter is effective at bringing it to full charge. Lastly, we have multi-phase controllers. These take the strengths of both the single phase and the single-phase controllers and package them as one. They can switch between high and low voltage outputs depending on the battery’s needs. The purpose of the battery is to store power. The typical RV system battery is six-volt requiring you to have two of these to match the system’s 12volts. The output of the battery is measured in Amp-hours (amperes per hour). There are three types of batteries – flood cell or wet batteries, gel batteries or absorbed gas mat (AGM) batteries. The wet batteries consist of lead plates and battery acid. Their strength lies in the ability to maintain more in-depth charging cycles as well as providing higher pea amp draw. The downside is that they are susceptible to corrosion and are cumbersome to manage. Gel batteries, on the other hand, make use of silica gel to store power. They are, however, charger controller specific as well as inverter specific. While there are low chances of spills with these batteries, they are less suitable for rapid discharge and are much costlier than AGM batteries. AGM batteries make use of a glass plate rather than lead. They are easy to charge, as long as the charger is of good quality, can maintain deep cycling and have a better rapid discharge. The purpose of an inverter is to transform direct current (DC) energy into alternating current (AC). A good number of gadgets and home appliances make use of AC power. The efficiency of the inverter is measured in watts. When searching for a solar panel, be sure to check if the inverter is the right one based on the size of the battery bank. The purpose of doing so is to keep from depleting your battery bank much faster than the solar panels can recharge it. Remember, the more efficient the inverter is at drawing power, the faster your batteries shall be emptied out. To ensure you have the right inverter for your battery, compare the maximum draw of your battery with the watt rating of your inverter. Ultimately, the key determining factor for the best RV solar panels is the amount of energy that is required to power up your appliances. Take a look at the labels that come with your appliances to understand its power needs. Once this is done, be sure to find a solar panel system whose battery is capable of meeting these power needs. Here, be mindful of the panel’s output. The output measure is an indication of the panel’s efficiency and effectiveness at recharging the system’s batteries upon use. If your power consumption is likely to be heavy, it is wise to opt for a panel with high energy efficiency as it is capable of recharging your batteries faster than one with low energy efficiency. Be sure to also match the inverter to your energy needs as well as to your battery bank. The costs involved in acquiring the right solar panels for your needs go beyond merely purchasing your best pick. Consider the cost implications of the installation process. 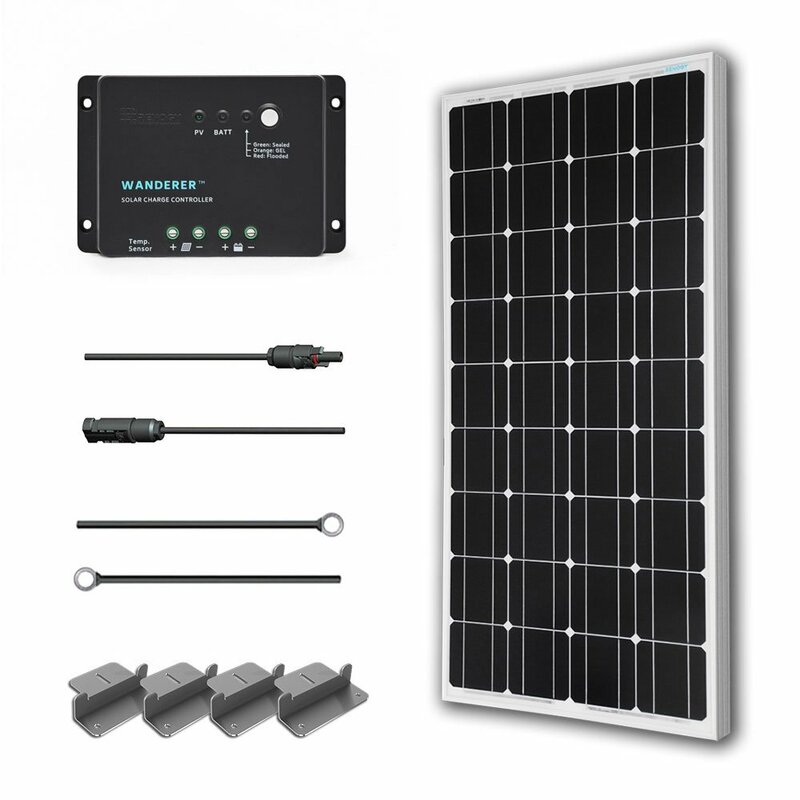 Does the solar panel system come with all the necessary mounting equipment that I need? Can I install it on my own or do I need to hire professional help? What are the maintenance costs involved, if any? Answering all these questions will help you arrive at a workable balance between a cost-effective and energy-efficient solar panel for your RV. To ensure that you have a cost-effective solar panel from the word go, ensure that your panel of choice comes with the necessary accessories to eliminate the added costs of purchasing them separately. A careful consideration of the pros and cons of the solar panels reviewed above has Renogy solar panel (100 Watt). We are particularly impressed by its effectiveness at converting solar energy into usable power. It is also well built and durable. Another perk of this solar panel is its lightweight. This feature makes it not only easy to install but easy to handle as well. Although this product is not perfect, the manufacturing company makes up for the product’s shortcomings by having an excellent customer service team. The fact that they stand behind their product helps to inspire the customer’s confidence in the quality of the solar kit they are purchasing. In the end, it can be a great addition to your RV. Investing in the best RV solar panels comes with several benefits. You have the freedom to move around knowing that the energy requirements of your appliances are being met. They are also an eco-friendly source of energy that makes use of Mother Nature’s gift of sunlight to satisfy your power needs. Lastly, they are a relatively low maintenance source of power making them a convenient and cost-effective camping companion. Even as we look to switch off from our daily lives and commune more with nature, we still have basic power needs. We need the power to provide lighting to enable us to find our way around the RV at night and even for security purposes. We also need to keep any foodstuff fresh enough for human consumption if our camping expeditions are for extended periods. Understanding your energy needs and how different components of the solar panel and the solar panel system in general works is essential. Such knowledge helps to ensure that you choose the best solar panel for your RV. Also, do not forget to check other customers’ experiences with products from different manufacturers. While the reviews are highly subjective and some biased, they help to give you a general expectation of product’s performance. Keep these buying tips in mind when shopping for the best RV solar panels. We hope they help. Happy camping folks and more power to boondockers!